The icehouse at Little Ouseburn was on the Kirby Hall estate. The house was demolished in 1920. The lodge to Kirby Hall was probably designed by Robert Lugar in the early 19th century. Kirby Hall Park was landscaped by J.B.Papworth in 1833. The house was demolished in 1920. 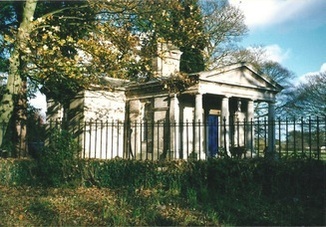 The mausoleum in the church yard at Little Ouseburn was built around 1742 for Henry Thompson who lived at Kirby Hall. He died in 1760. Thompson was a friend of Lord Burlington and was influenced by his Palladian style. The rotunda has an attached Greek Doric colonnade and faces Thompson's estate. Kirby Hall was demolished in 1920.